Sitting volleyball had its origins in the German game called sitzball, but it was the Dutch in the 1950s who modified sitzball and developed the contemporary, fast-paced and entertaining game. World championships of sitting volleyball for men and women have been held since 1993. Volleyball first featured as a Paralympic sport when both sitting and standing forms for men were introduced at the 1976 Toronto Paralympics, with Sitting Volleyball as a demonstration sport. Sitting and standing forms of volleyball were both official events at the 1980 Arnhem Paralympics and male competitions in both forms continued up to and including the 2000 Sydney Paralympics. At the Sydney Games, Australia qualified for the Sitting Volleyball competition for the first and only time, because it was the host nation. The Australian team finished 11th of 12 teams, defeating the USA to avoid a last place finish. 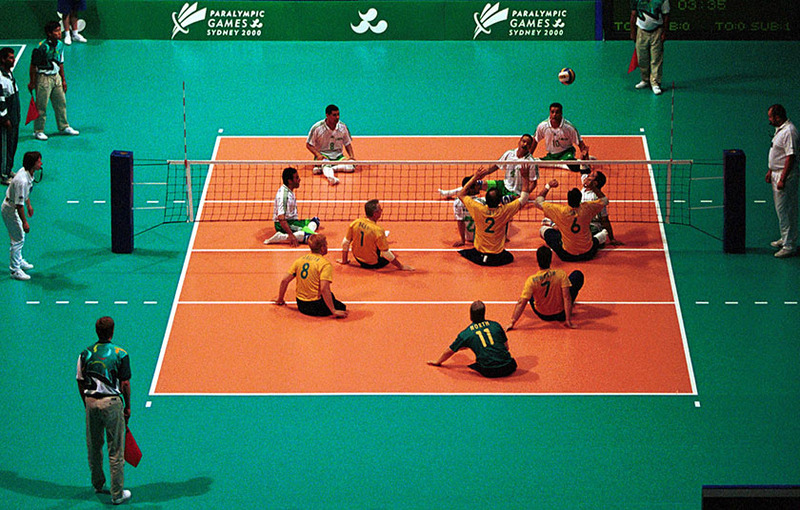 While Australia has not qualified since 2000, there is still an active Sitting Volleyball program in Australia. Following Sydney, Standing Volleyball was removed from Paralympic competition, and Sitting Volleyball was introduced for women for the first time in 2004. Sitting Volleyball for men and women remain prominent team games at the Paralympics. Sitting Volleyball consists of two teams of six players, separated by a net, who score points by grounding the ball on their opponent’s side of the court. The game is played in a best-of-five set format, and the first team to attain 25 points (with at least a two-point lead) wins the set. There are two classification types, disabled and minimally disabled, and a maximum of one minimally disabled players is allowed on the court at any time. Sitting Volleyball is very similar to its stand-up version. The key differences are that players are seated and their pelvis must remain in contact with the ground, the serve can be blocked, the net is lowered and the court is smaller than in standing Volleyball.